I tend to make things work hard in our household. We wear things out and down until it’s crying and holding on to the last inch of life. Even my bush clippings work hard in my house. 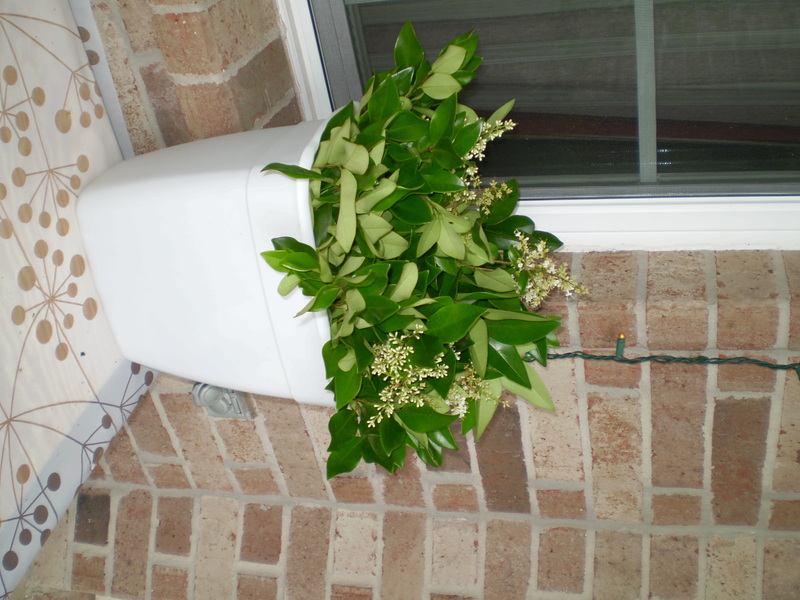 After clipping the bushes in preparation for a murder mystery party, I took the clippings and filled a white trash can with the clippings and extra water. 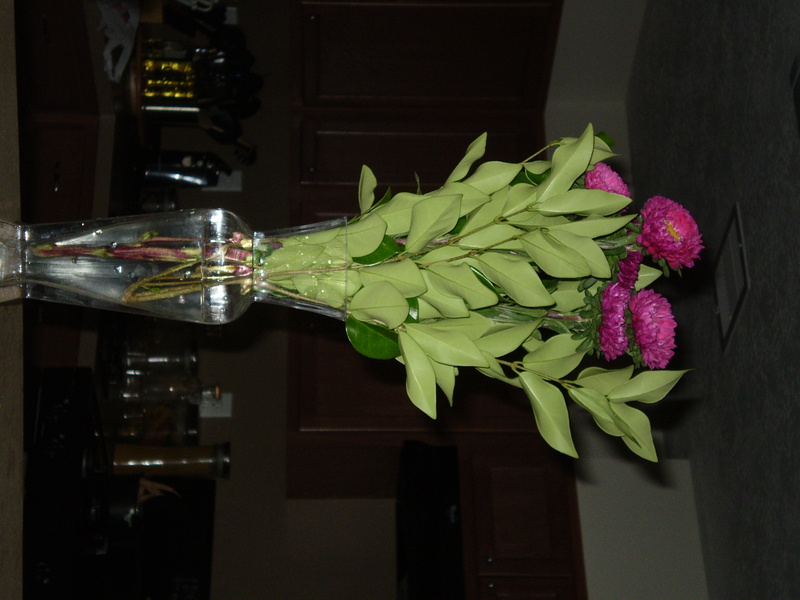 that made a $4 bouquet spread throughout the house. What have you done with branch clippings? Well if you guessed I was making her a kit to take over the world, you were right! I had to put aside my own dreams and ambitions-I really wanted the firefighter set-and think about the little one. What would she like? Thankfully she was a pro at pretending, so I decided to run with that. My inspiration was the cute little baskets, don’t they look like they belong in your local market? 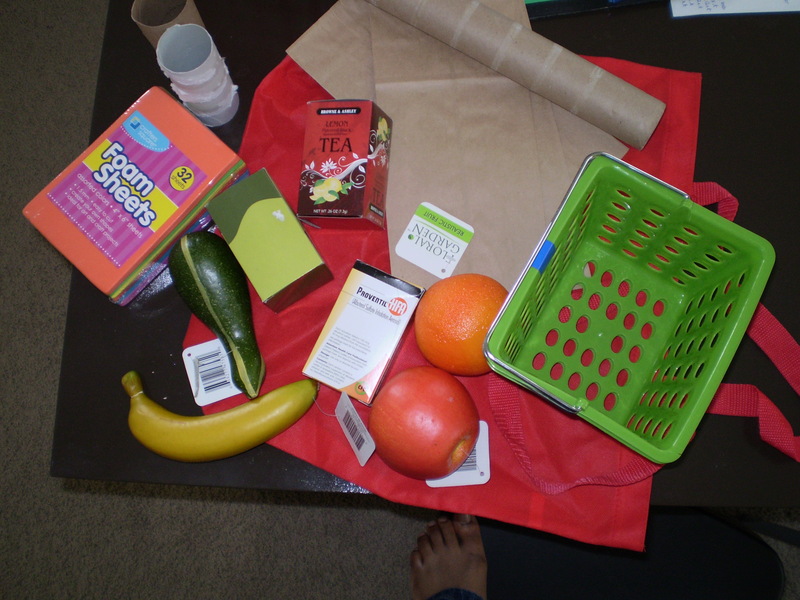 Add a few fake fruits and veggies and my idea for a full-fledged grocery store was taking shape. Welcome to the world of small business ownership little one! I had to bring my dreams down a bit as I reminded myself that she’s only 2 and I didn’t know how much room was available to set up an actual storefront and bins full of fake produce a la the one that Pam from London made. 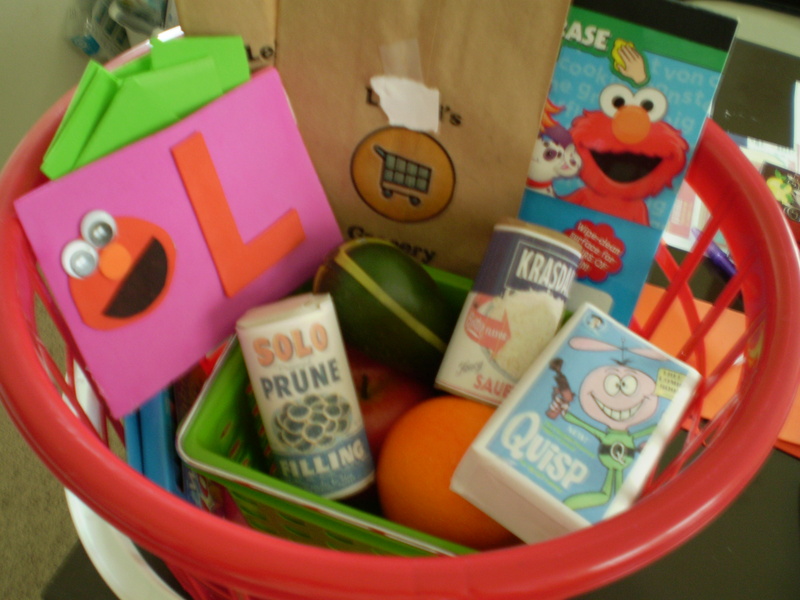 Instead I made sure that everything would be able to be corralled into a big red basket for easy clean-up. So what does a market need? 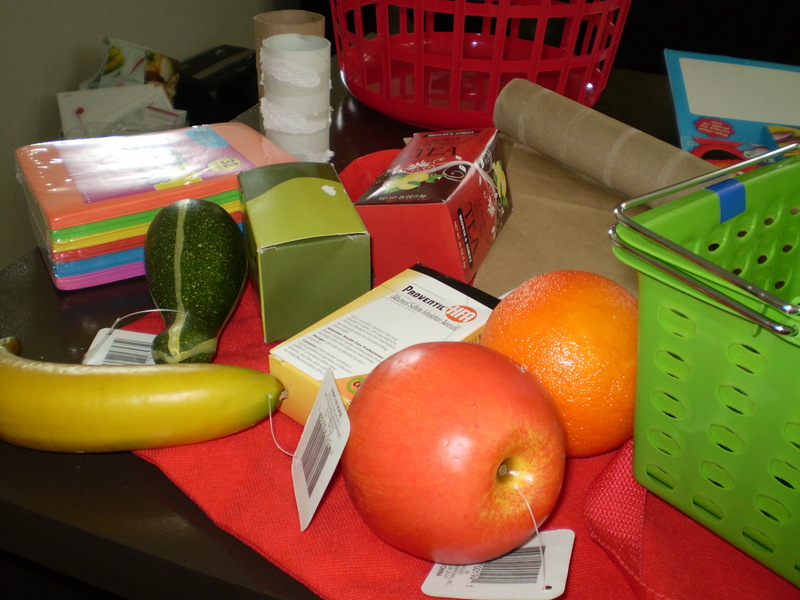 Well, you need produce-which was easy enough, simply cute off the tags and pop in the baskets. You need bags to bag all your groceries in. 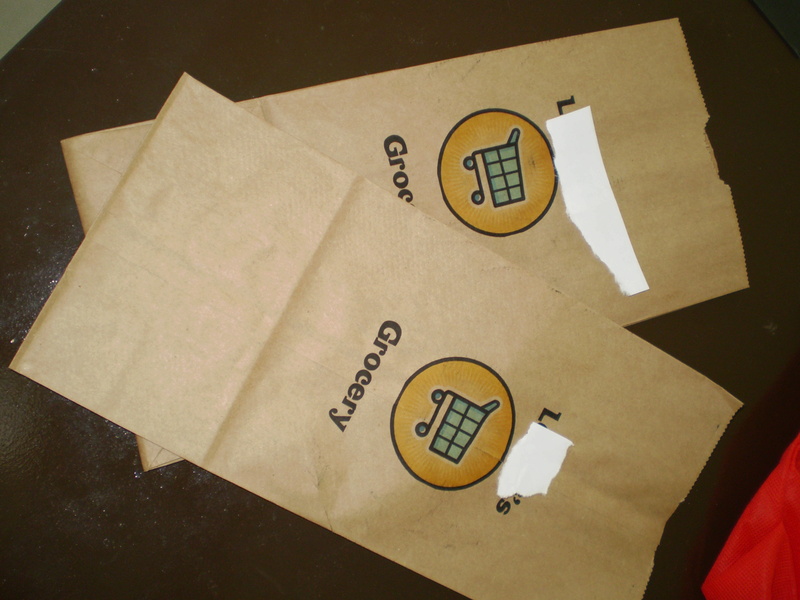 Placing lunch sized brown paper bags in the printer created personalized bags for the store. What about processed foods? 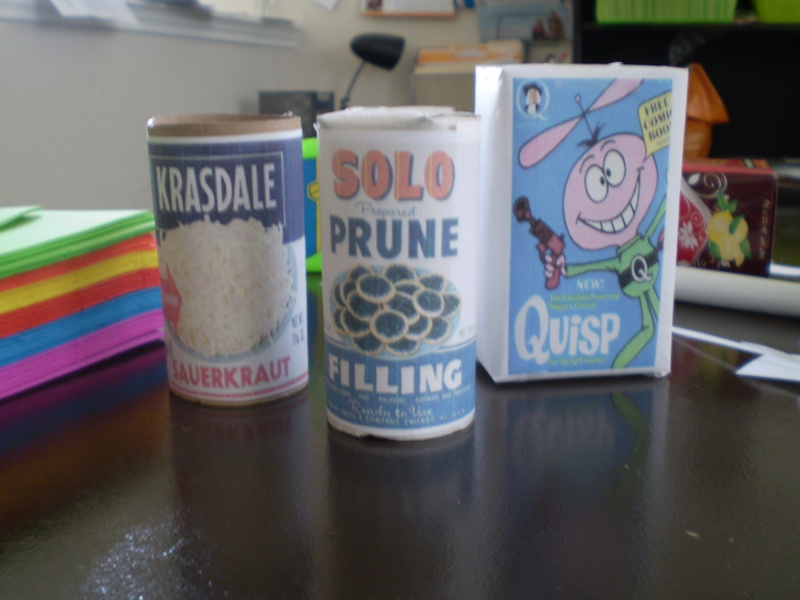 After trying my hand at creating personalized food labels and running out of cute ideas for cereal names, I googled vintage images and found quite a few images of retro cereal boxes and canned goods. 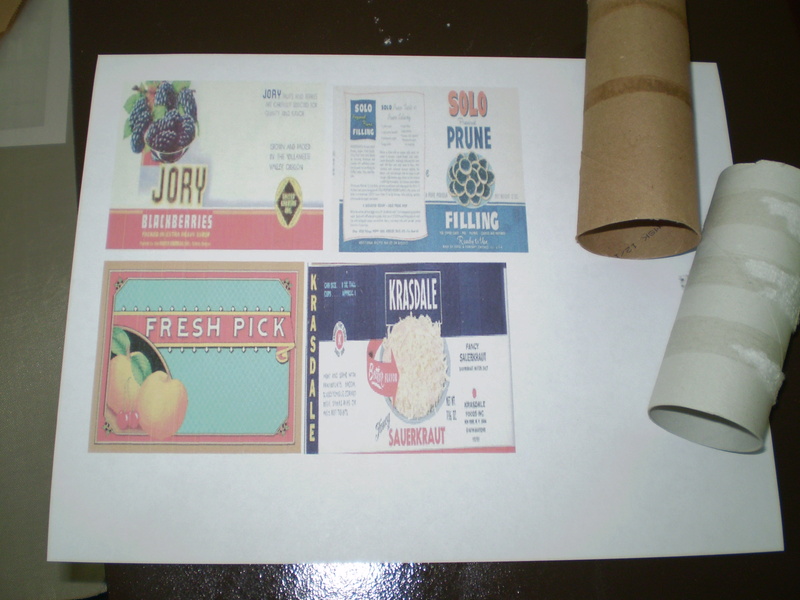 Pasting them to repurposed boxes and paper towel rolls created enough processed food for a little shelf. Yummy, healthy foods like prunes. Anyhoo, I cut the green foam into dollar bills. I thought about finding a photo of her and making her the center of the bill as the future president…maybe next birthday. After the dollar bills were cut, I needed a place to store them-thinking of future clean-ups. I quickly glued two foam sheets together to form a wallet and then cut out circles to make a grinning Elmo. 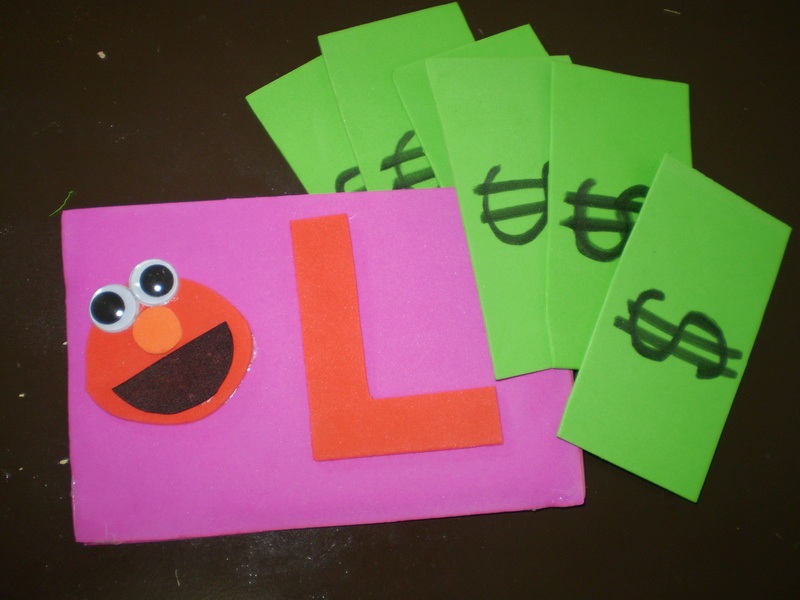 Elmo looked lonely on the big wallet, so I added a large letter L for her name on the front. Once it was stuffed with dollar bills it was so cute. Now she could learn math skills while purchasing her groceries. 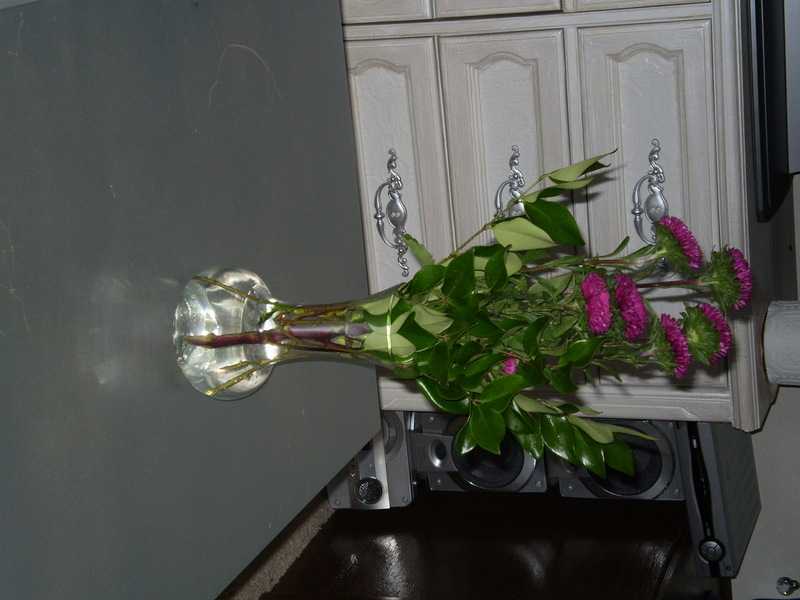 After taking photos of the finished product, I realized that I forgot the coupons! 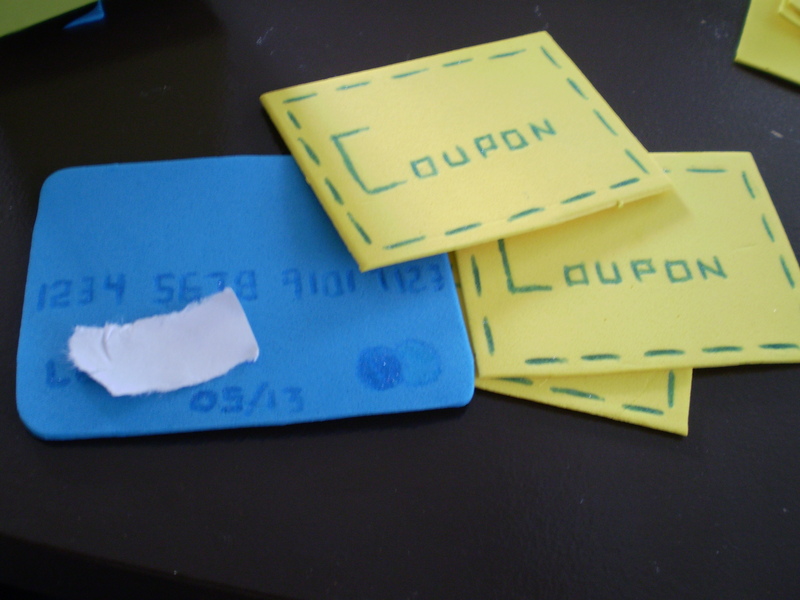 You can’t go grocery shopping without coupons! Oh, what about a credit card! A few snips of the scissor and I had coupons and a credit card ready for the little one. It was so much fun to make this for her and get this, it was all less that $8. Yep, everything in the basket, less than $8. I wonder if she’ll let me play with her? What was your favorite gift as a child? I’ve been invited to the birthday party of a little girl who I’ve been blessed to have monthly picnics and tea parties with when I serve in the church nursery. Those who know me, know that I’m a pretty nerdy gift giver. Usually hubby helps me find something not so nerdy and is more fun for a child. Well, hubby wasn’t with me this shopping trip. I searched the aisles looking for a unique gift that would knock down barriers and society’s expectations and at the same time intellectually challenge the little girl. Since she was turning two it had to be fun too. Did I mention that I’m a nerdy gift giver? A pizza baker and owner with a little felt pizza and interchangeable felt toppings. Add a cute little personalized apron and pie pan for the ultimate fun in pizza making and introduction to small business ownership. A personalized firefighter (not fireman) kit with jacket that I would embroider her name to along with several tools and a cute little red bucket that resembled a fire hydrant to store it all in. Lots of pink princess stuff that jumped into my basket in spite my search for items that would break gender barriers. Any guesses as to what I will do? 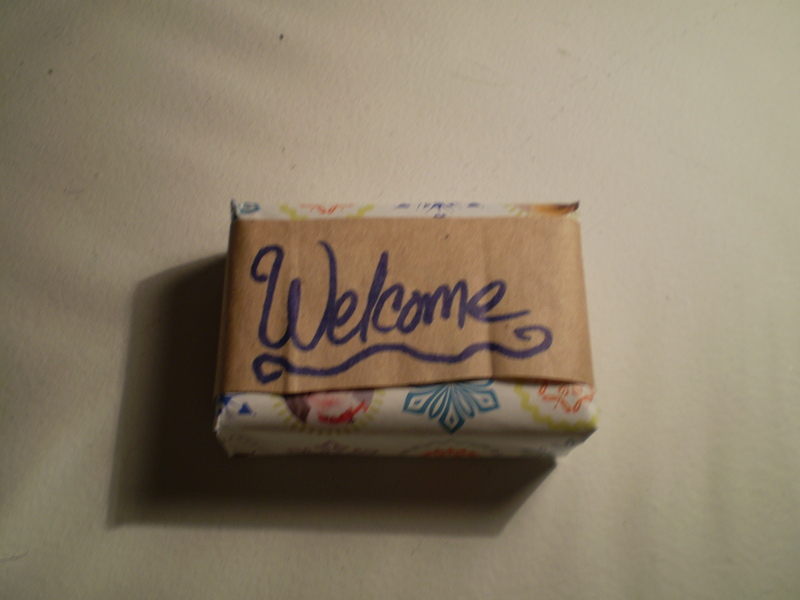 Someone asked if I could show a photo of the wrapped soap that I made for my in-laws visit. Instead of just showing you the wrapped soap, I thought I’d show you the secret to being able to entertain my guests on a whim. I introduce you to the “Guest Box”. It’s a simple shoebox that I wrapped and is kept in the linen closet. 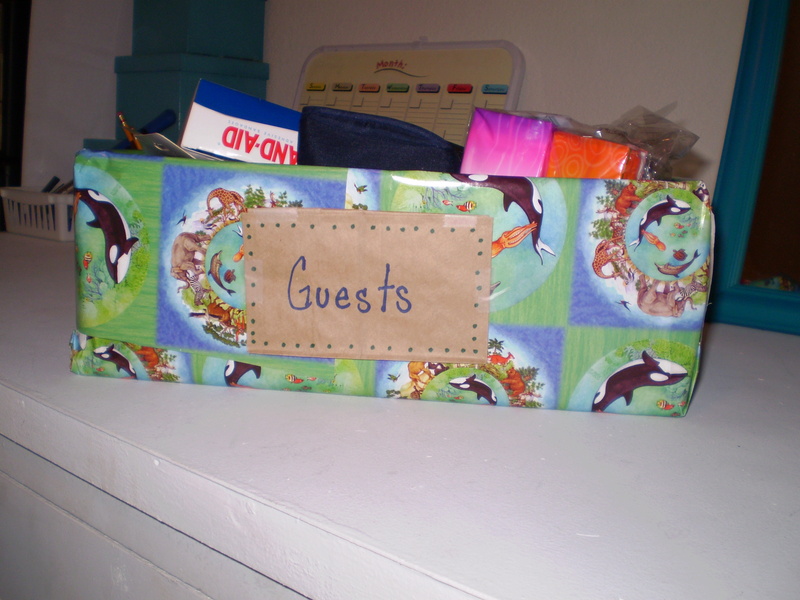 All guests are made aware of the wonderful box of fun after being shown to their room. 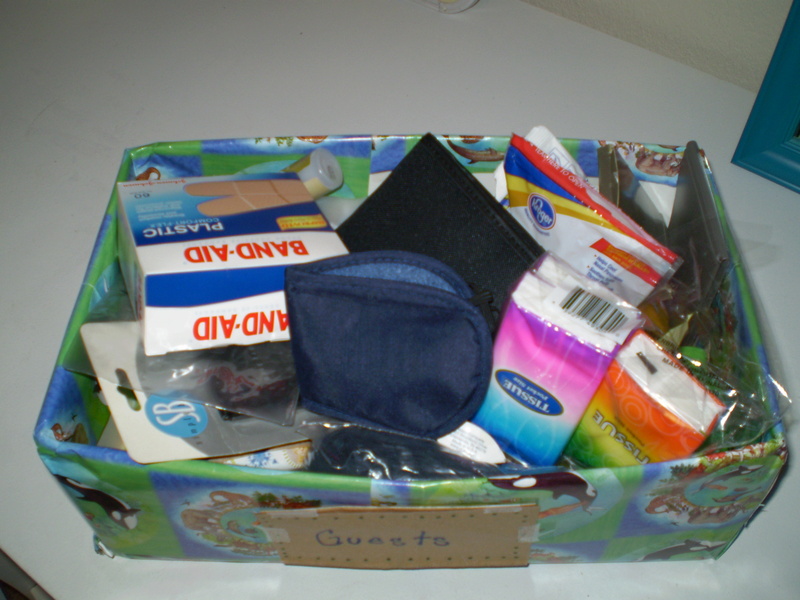 The box contains several supplies for overnight guests so that they’re comfortable. 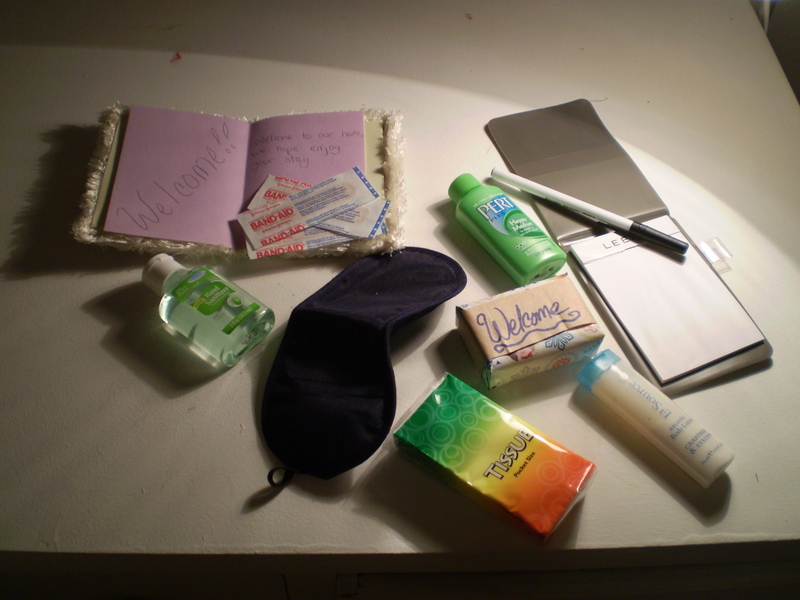 Things like band-aids, sleeping masks, tissues, cough drops, hand sanitizer and more. My handy box makes everything so easy. I love to entertain, which sometimes includes hosting guests overnight. 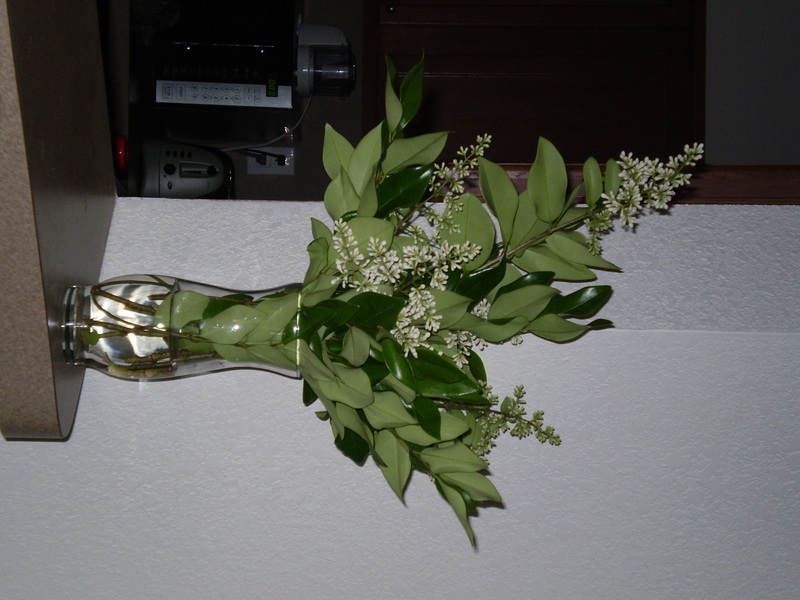 When a person stays in my home, I try to make their stay like a luxury hotel as best as I can. 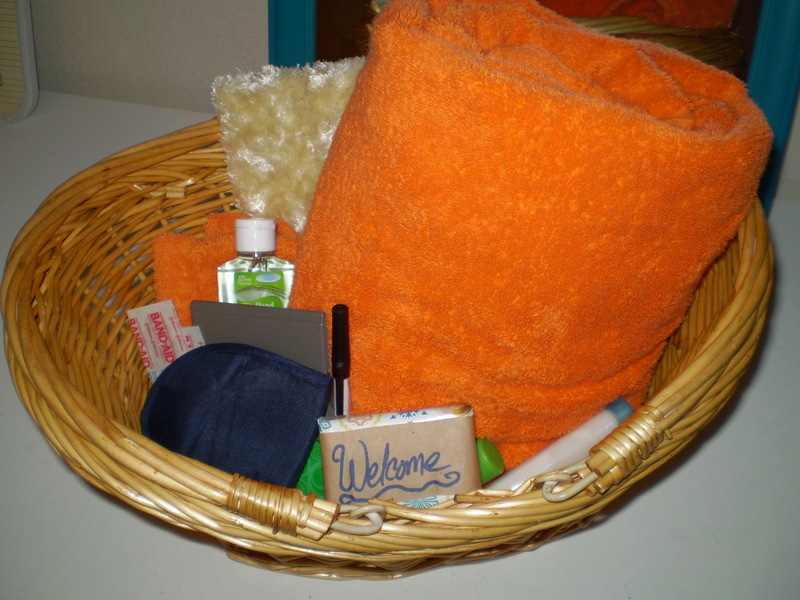 This often includes a personalized guest basket to make their stay comfortable. A friend came to visit me recently, so I grabbed the guest box and a large basket from the linen closet. I took out a small bottles of tolietries and included a fuzzy photo-album and a notepad since this friend loves to take photos and journal. Each basket also gets a welcome note explaining little things like the location of medicines and instructions to not allow the cat to take showers with you-no matter how much he begs-and generally just wishes of how much I hope they’ll enjoy their stay with us. Everything gets put inside the basket, including a set of towels for my guest to use during their stay. It doesn’t cost much to maintain the basket, a trip to the dollar store every now and then to restock on soaps or toothbrushes, but I like to think that my guests appreciate the gesture. 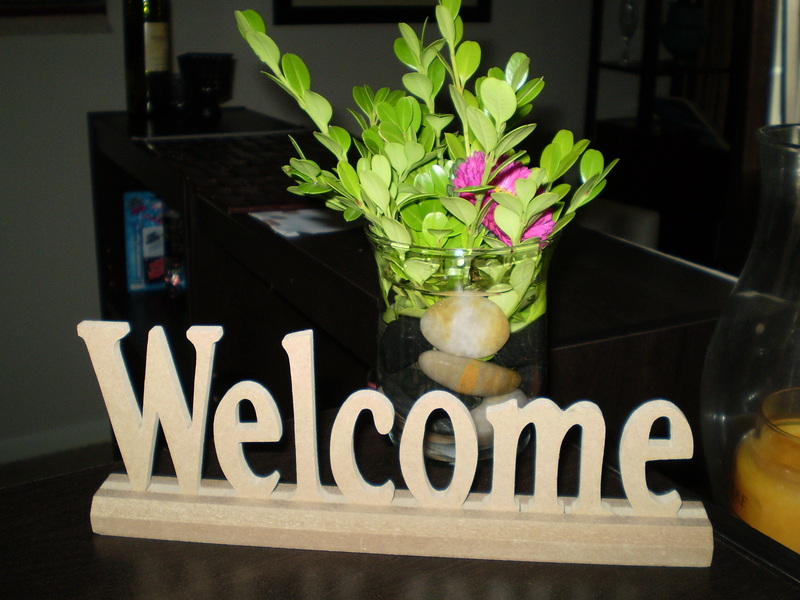 What do you do to make your guests comfortable? Finally sat down and made some concrete plans about this freezer meal thing. Actually, I made one week of plans. Pizza Wednesday is because instead of $5, pizza is on sale for $3, a great day for pizza, don’t you think? I put some of my own recipes in the menu plan, but otherwise used supercooks for some recipes. Preheat oven to 400 degrees, with a fork, prick squash in several places. Place on a rimmed baking sheet; bake until soft to the touch, about 1 hour. Bring a large pot of lightly salted water to a boil. Add 2 servings of pasta, cook, drain. Heat 1 can of tomatoes over medium-high heat. Bring to a slow boil and stir in ¼ lb cubed brie cheese. Reduce heat to medium-low, and stir to melt cheese. Package sauce. Follow honey shrimp recipe, then SS, then lettuce wrap steak. Package. 2. Meanwhile, in a large saucepan, heat tomatoes over medium-high heat. Bring to a slow boil and stir in cheese. Reduce heat to medium-low, and stir to melt cheese. Preheat oven to 400 degrees. With a fork, prick squash in several places. Place on a rimmed baking sheet; bake until soft to the touch, about 1 hour. When cool enough to handle, halve squash crosswise. Scoop out seeds; discard. Scrape flesh into strands. In a large skillet, heat oil over low heat. Add garlic; cook until fragrant and just starting to color, about 5 minutes. Add squash; season with salt and pepper. Cook, tossing frequently, until squash is very hot, about 5 minutes. 1. In a bowl, stir together water, ketchup, soy sauce, cornstarch, honey, crushed red pepper, and ground ginger. Set aside. combine lentils, water and bacon in saucepan. boil, reduce heat, cover, simmer 45 minutes. add potatoes and simmer 15 more minutes. stir in vinegar and sugar. In saute pan, saute onions and parsley in olive oil, until onions are transparent. stir onions into lentil mixture and serve. So freezer cooking is a concept where you prepare all the meals and then freeze then. It usually requires one full day of cooking. I’ve done variations of this in the past and the biggest hurdle for me is the clean-up. However, I want to try it again-this time including breakfast for me; lunches for hubby and I; and of course dinner for hubby and I. Instead of a month’s work of meals, I’ll just do two weeks of meals. The steps seem easy enough. Decide what to cook. Plan around what’s on sale or what’s on hand. Cook! Broken down into preperation, cooking, assembling and freezing. Since I’m still dealing with just me, I decided to experiment with two weeks worth of solo meals. 1. Decide what to cook. A quick look in the freezer pantry provided some clues of what needed to be cooked and fast. 3. Shop. No shopping needed, I have everything I need. The Plan: I decided to start the first official week and eat all the perishables first. This included yogurt, brie, salted cod, tapenade, a cooked steak and some potatoes that were quickly growing into plants in the pantry. The Plan for Week One. *I cheated and went grocery shopping-twice. I wanted some fresh fruits and vegetables and there were none in the house. I stocked up on fresh spinach, apples, lettuce and avocados. Then I spotted almonds on sale, imitation crab for some homemade sushi, balsamic vinaigrette on sale (note to self, plan on cheating more to stock up on the vinegar), my breakfast cereal on sale, pomegranate juice on sale and two types of yummy cheese, not on sale, but yummy. I noticed that I tend to snack through the day or do without meals. Why? Because I don’t want to exert the effort to cook the meal. To combat this, I will try the method of freezer cooking so I will always have meals to pull out and warm up with minimal effort. Also, I’ll actually eat something more than an apple! Ugh, time for plan b!